The Paw Patrol is always trying to make sure that the world is as safe and secure as it can possibly be. With all sorts of other missions always being taken care of, you'd think that there would hardly be room for a mixed-breed pupper! Fortunately, Ryder knows the full skills of all his canine friends and sees that Rocky is the perfect pup to make sure the environment is safe from litter. Hopping to recycle and reuse everything he can find, this pup knows just what Earth needs! Your kiddo can feel all the same fun and keep the world safe while wearing this officially licensed Paw Patrol costume hoodie. This Rocky Hoodie is a bright green and features the Eco Pup's face and hat on the front. Zip up the fun and pull over the hood and your kiddo will be ready to live out all their Paw Patrol adventures, maybe even while doing some of the household chores! Kids tend to get into everything and reinvent old stuff for new fun. Since they have that natural recycling instinct, why not put it to good work! 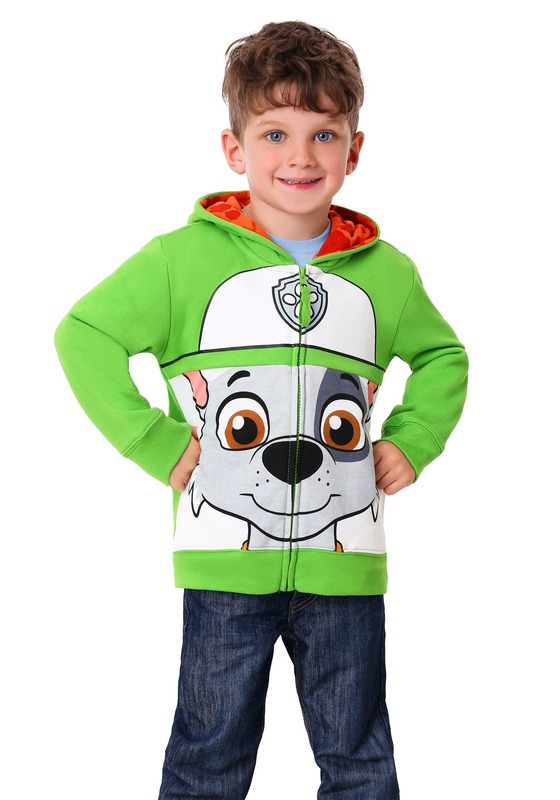 Teach them how to save the environment while enjoying pupper antics at the same time with this Rocky Costume Hoodie from Paw Patrol.